Back in September at the Oppo N1 launch event we managed to get some quality time with the smartphone, but now we are finally able to welcome it to our office. As tradition dictates we’ve prepared a hands-on video to whet your appetite before the review comes. The Oppo N1 is powered by a Snapdragon 600 APQ8064 chipset with four Krait 300 CPU cores clocked at 1.7GHz, 2GB RAM and an Adreno 320 GPU. There are two versions in terms of storage, 16GB and 32GB, but there’s no microSD card. 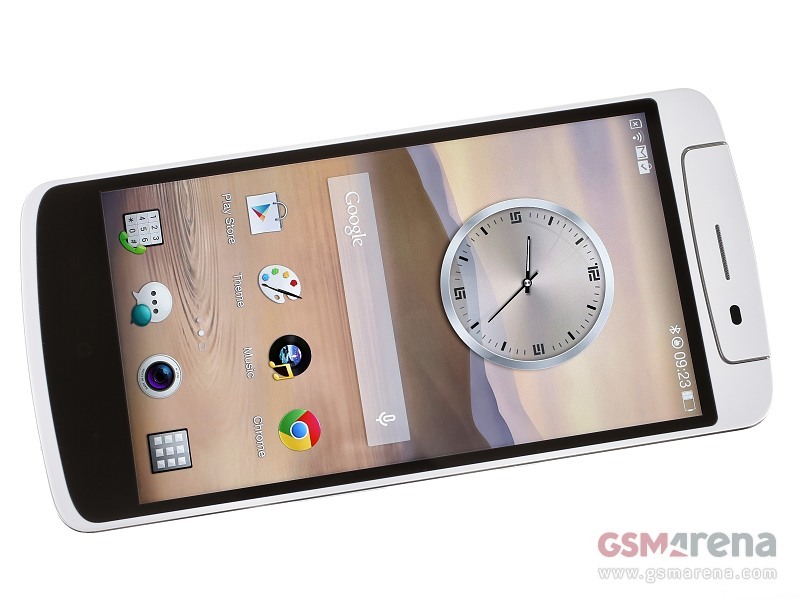 The Oppo N1 is a phablet rocking a 5.9″ screen with 1080p resolution resulting in a pixel density of 373ppi. It’s a fairly large device, measuring 170.7 x 82.6 x 9mm and weighing 213g. For comparison a Galaxy Mega 6.3 measures 167.7 x 88 x 8mm and weighs 199g and that’s with a bigger 6.3″ screen. On the up side, the N1 packs a generous 3,610mAh battery. The Oppo N1′s camera packs a twist – it’s can be rotated 206 degrees so you don’t have to use a secondary lower-quality camera for self-portraits. Inside it there’s a 13MP CMOS sensor with 6-element lens on top and a custom imaging chip that Oppo and Fujitsu co-developed. The rotatable mechanism is quite complex – there are as many as 67 parts in it and Oppo has calculated the gaps so that it can rotate 206° and feel perfectly solid in every position. The back of the N1 holds another interesting feature called O-Touch. It’s 40 x 30mm touch-sensitive patch on the back of the phone which is used to control the UI and apps. We demonstrate how it works in the video below and it really helps with one-handed use. Android 4.2 Jelly Bean is at the driver’s seat and has been heavily modified by Oppo’s Color OS user interface. It adds a lot of cool customizations and alterations to the stock Android experience. Check out the hands-on video below.